Jesus saith unto her, Thy brother shall rise again. Martha saith unto him, I know that he shall rise again in the resurrection at the last day. Jesus said unto her, I am the resurrection, and the life: he that believeth in me, though he were dead, yet shall he live: And whosoever liveth and believeth in me shall never die. Believest thou this? is an exclusive prophecy which excludes all but Martha’s brother, Lazarus. 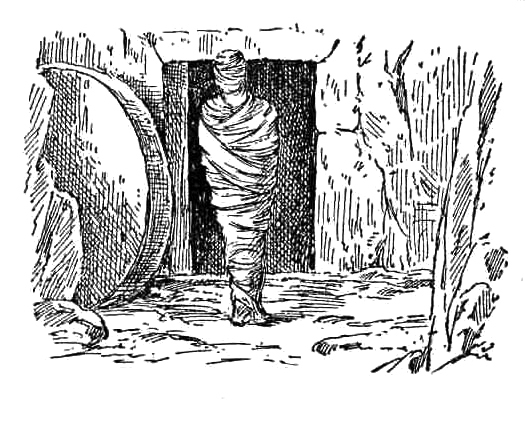 The second prophecy includes all that believe in Him, including Lazarus. This study of course involves prophecies of Jesus that have been fulfilled. The first prophecy obviously has been fulfilled. History tells us that Lazarus was raised from the dead by Jesus and then he was put to death by the Pharisees who didn’t want exhibit A of the power of Jesus walking around the streets of Bethany looking very much alive. The second prophecy, the one that includes you and me, has not been totally fulfilled. The prophecy has been partially fulfilled and in such a convincing manner that we can rest assured that like Lazarus we too who believe in Jesus, though we will die, yet shall we live. Father God, He whom thou lovest…. When Jesus heard [that], he said, This sickness is not unto death, but for the glory of God, that the Son of God might be glorified thereby. can be translated as physical death or spiritual separation from God or spiritual death. The Greek word is , and if we take this to mean spiritual death, then Jesus could be saying that this sickness is strictly physical and because of the faith of Lazarus in Jesus, this would not be unto spiritual separation or spiritual death. I believe it to be both that Jesus looked at physical death as sleep and that this would not result in Lazarus being dead spiritually because of his faith in Jesus as the Christ. This sickness is not unto death, but for the glory of God, that the Son of God might be glorified thereby. Jesus was going to show through the physical death and resurrection of Lazarus who He, Jesus, was and is beyond any shadow of doubt. He is the resurrection and the life. He is the Son of the living God. He is God and without Him was nothing made that was made, John 1:3. Jesus, if you had been here, you would have healed my brother of this sickness and he would be alive. Thy brother shall rise again. I know that he shall rise again in the resurrection at the last day. Well I believe in a resurrection, but not everyone does. It doesn’t really have to be a physical resurrection, it could be an allegory or just a nice story to give us hope or something. I know that my brother will rise again in the resurrection at the last day. We live in a world where Christians or anyone who KNOWS something is looked down upon for portending to know something. We live in a world where it is thought to be loftier to be searching for the truth, to believe that truth cannot be known, or to believe that truth doesn’t exist, than to actually KNOW truth. Martha, praise God, knows something. She has a belief that has taken hold with faith and through these eyes of faith she can see this truth of the resurrection in the last days. By the way, what Jesus does on this day, proves without any shadow of a doubt that this resurrection on the last day will occur, because He proved Himself to be the resurrection and the life. He of course also proved this when He took up His own life again after being in the tomb for parts of three days. I am the resurrection, and the life: he that believeth in me, though he were dead, yet shall he live: And whosoever liveth and believeth in me shall never die. Believest thou this? Yea, Lord: I believe that thou art the Christ, the Son of God, which should come into the world. and Jesus uses this phrase seven times in the book of John. Some say that Jesus never claimed to be God. That statement could not be more wrong and many times it comes from scholars who know better, but are bald face liars. It is not my point at the moment to list all of the times Jesus claimed to be God, or to even list the seven “I am” sayings in the book of John. But I will say clearly though that this is one instance where Jesus uses “I am” in the same since as the answer God gave to the question Moses asked God in Exodus 3:13. Only God can be the great I am. Because God is not held hostage by time or bound by time, and because He is eternal and timeless, He is always I am. In the past He is I am. In the future He is I am and in the present He is I am. Jesus in this verse uses a term that Jews understood and recognized that this statement was a statement that tied Jesus to God and that it expressed that Jesus was eternal and that being eternal, He was and is God. We can be assured of this because by faith we have caught a glimpse of resurrection power and resurrection life. We can believe and have faith in the dead living again and in a resurrection and the rapture because Jesus has proved to be the resurrection and the life by raising Lazarus from the dead, and by laying down His life and taking His life up again on the third day. He indeed is the resurrection and the life. He that believes in Jesus, though dead, with all certainty shall live. I am the resurrection, and the life, he that believeth in me, though he were dead, yet shall he live. I believe that thou art the Christ, the Son of God. to the question, but then qualifies her confidence in Jesus being the resurrection and the life. What qualifies Him to be the resurrection and the life? Thou art the Christ, THE Son of God. His name is to be praised for He and His name are high and mighty. For we have not a high priest which cannot be touched with the feeling of our infirmities. Jesus though is actually touched with the feeling of our infirmities. Jesus felt the despair and entered into their despair just as He entered into our world by being born of a virgin. Jesus wept. He also might have wept knowing what the road ahead had in store for Lazarus. He would not have an easy second physical death because he was put to death by the Pharisees who could not allow exhibit one of the power of Jesus living and walking the streets of Bethany as proof that Jesus is the resurrection and the life. In John 11:39 Jesus said, “Take ye away the stone”. But Martha said to Him, “Lord, by this time he stinketh: for he hath been dead four days”. John 11:40 “Jesus saith unto her, Said I not unto thee, that, if thou wouldest believe, thou shouldest see the glory of God?” Again, this is the reason Jesus tarried where he was for two days. It was time to show His glory and to show that He is the resurrection and the life. John 11:41-42 “Then they took away the stone from the place where the dead was laid. And Jesus lifted up his eyes, and said, Father, I thank thee that thou hast heard me. And I knew that thou hearest me always: but because of the people which stand by I said it, that they may believe that thou hast sent me.” Jesus here prays in a way that lets those who are watching and listening, know by what power and authority He will raise Lazarus from the dead. This also lets them know what authority and power He has, which is the authority and power of God. He is God incarnate, who was the Son at one with the Father without beginning or end. In fact He is the Alpha and Omega, the beginning and the end. ohn 11:43 “And when he thus had spoken, he cried with a loud voice, Lazarus, come forth.” I believe that Jesus had to call Lazarus by name to avoid every believer under the Old Covenant from being resurrected. 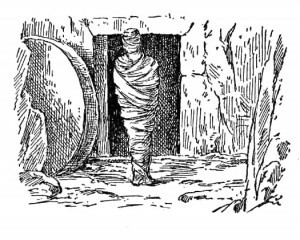 This is also personal as we remember Lazarus is called “he whom thou lovest”. Intimates call each other by name and Jesus called Lazarus by name. Have you placed your faith in the substitutionary death of Jesus on the cross? Have you been born again? Do you talk to God often and bring all of your petitions to Him? You too can be an intimate of God. It is true that God is not a respecter of persons, however he does have His intimates. In the previous chapter John 10:27 Jesus says, “My sheep hear my voice, and I know them, and they follow me”. Lazarus knew the voice of Jesus. Jesus had spent much time at the house of Lazarus and his two sisters and they had heard Him teach and had engaged no doubt in small talk with the Savior. And if I go and prepare a place for you, I will come again, and receive you unto Myself, that where I am, there ye may be also. The word if here at the first of the verse, “And if I go…”, was translated “if” by the King James scholars, and rightfully so. The word if has changed meaning slightly over the years and in today’s English would be translated since. “And since I go and prepare…”. This is not something that is left undecided, it is assured that He has gone to prepare a place for us. We can rest in the promise of this prophecy because our Savior is the way, the truth, and the life. He is also the resurrection and the life.